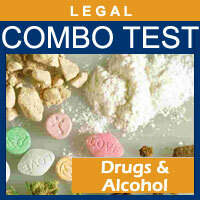 There are many reasons to test an individual for alcohol abuse, such as for family court matters or hiring decisions. For safe, reliable testing with results they can count on, law enforcement agencies, healthcare professionals, and employers turn to the AbuseCheck™ Hair Alcohol Abuse Test. The AbuseCheck™ Hair Alcohol Abuse Test is a non-invasive testing procedure which provides a definitive timeline of alcohol abuse from one to six months depending on the test administered, to identify individuals with recent histories of alcohol abuse. While blood tests are used when a person is intoxicated, the Hair Alcohol Abuse Test has a longer detection window than urine, blood or saliva, and yields accurate usage history needed to prove alcohol abuse and/or dependency. This follows what is defined by the World Health Organization (WHO) as ‘average levels of alcohol consumption in excess of 60 grams of alcohol per day‘ – which is the level at which is believed to result in a high probability of suffering from related medical problems if sustained over a significant period of time. The AbuseCheck Hair Alcohol Abuse Test is convenient because hair samples are easily acquired; and since hair cannot be adulterated, the test delivers accurate results that determine whether or not the subject is an abusive alcohol drinker. All work is done by an accredited laboratory that processes 1000s of Hair Alcohol Abuse Tests tests each year, and growing! Results are available within two weeks. This forensic test is used by a variety of individuals, professionals, corporations and agencies to get definitive answers about alcohol abuse among clients, defendants, relatives, victims, and employees who may have been touched by alcohol abuse. Attorneys, law enforcement agencies – use in custody cases to determine if a parent is fit to have custody, test repeat offenders of DUI, spousal abuse, post-accident testing of the person at fault if BAC was not established quickly enough, such as in a hit-n-run case. Human resources – find out if current employees or potential new hires are abusing alcohol to determine fitness to work (especially with vehicles and heavy machinery or public safety jobs) or to investigate a decline in job performance. Can also be used by staffing agencies that screen potential hires for substance abuse. Healthcare professionals, healthcare facilities– identify people with alcohol addiction or prove a patient does not have a dependency problem, measure efficacy of an alcohol treatment program, detect recidivism among alcoholic population, screen organ donors. Forensics – detection of ethanol in a post-mortem toxicology report may provide insight into the individual’s history of alcohol consumption which may be relevant to a case or cause of death; provide evidence of alcohol abuse as a probable cause of wrongdoing or foul play. Parents and other relatives – test your teenagers or other family members to be certain they are not abusing alcohol, detect potential abuse problems early in development in order to institute corrective treatment. Public Sector: Many public organizations and sectors examining the physiological and behavioral effects of alcohol can utilize this test to aid in their research (i.e. studies between the correlation of alcohol habits and risk of vehicular accidents). Two key factors make AbuseCheck™ highly accurate. 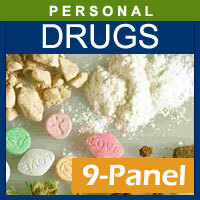 One is that alcohol (from beer, wine, hard liquor or other sources) does not appear in the body in any other form (i.e. gas) that would cause ambiguities or false positive results. The other is that, unlike drugs which are deposited directly in the hair, these alcoholic substances break down into the ethanol byproducts. The AbuseCheck™ Hair Alcohol Abuse Test is unique in that the procedure looks for these direct byproducts of ethanol metabolism, and not just ethanol itself. Thus, the presence of other forms of alcohol such as isopropanol (rubbing alcohol) or ethylene glycol (antifreeze) do not have an influence in the results. However, recent studies have shown elevated levels of FAEE in hair could be the result from hair treatment products containing alcohol (see: Forensic Science International, 2011). For this reason, it is suggested that both EtG and FAEE be used to test for signs of alcohol abuse. To that end, AbuseCheck™ conducts two distinct types of hair alcohol tests called FAEE and EtG hair testing, which test for different types of markers and report on alcohol abuse over different periods of time. The most common use for these products is in child custody cases, where one or both parents are being accused of regularly consuming excessive amounts of alcohol. Both the FAEE and EtG Hair Alcohol Abuse Test are well established and proven science which leads to an accurate result for proving whether a person has been drinking alcohol excessively. FAEE stands for fatty acid ethyl esters, a direct and very specific metabolite of alcohol, produced in the body when alcohol is consumed and digested. This metabolite provides a greatly specific indicator of excessive alcohol consumption over a period of time of up to six months. Studies have showed that FAEE markers are relatively stable in hair, and that the effect of hair care and hair cosmetics on FAEE concentrations does not significantly decrease concentrations. However, recent studies have shown elevated levels of FAEE in hair could be the result from hair treatment products containing alcohol (see: Forensic Science International, 2011). This is because the cells around the hair are capable of metabolizing alcohol and leading to an FAEE byproduct. As a result, this FAEE marker is sensitive to false-positive results, therefore testing in tandem with the EtG delivers a more accurate report on alcohol abuse. FAEEs and Hair: When alcohol is consumed, the main part of it is oxidized in the human body, and released as water and carbon dioxide. However, one part of the alcohol reacts with fatty acids to produce molecules called esters, or fatty acid ethyl esters (FAEEs). The sum of the concentrations of four of these—ethyl myristate, ethyl palmitate, ethyl oleate and ethyl stearate—can be used as indicators of the alcohol consumption. Most currently, it is suggested that using only ethyl palmitate to assess the amount of alcohol consumption which has taken place during the detection period (see Society for Hair Testing). Basically, the more ethyl palmitate FAEEs are present on the hair, the more alcohol has been consumed. FAEEs get into the hair primarily by diffusion from sebum, the oily substance that helps prevent hair and skin from drying out. They are absorbed into the hair, as the hair grows, from the sebum on the scalp or skin. Thanks to the benefits of modern technology and mass spectroscopy, the AbuseCheck™ hair alcohol test is able to detect and measure these amounts in nanograms (one one billionth of a gram). The hair sample may be taken from other areas of the body if it is not possible to take it from the scalp. Ethyl glucuronide, or EtG, is another metabolite of alcohol; its markers are formed almost exclusively in the liver and then deposited into hair mainly from sweat. As with FAEE, the more markers there are, the more alcohol has been consumed. The EtG hair alcohol abuse test provides a good indicator of excessive alcohol consumption over a zero to three-month period of time. The EtG test should be performed on the most recent hair growth from the scalp or body hair (excluding pubic hair), corresponding to the last three months. It is also recommended that the EtG test always be combined with the FAEE test. Studies have found that frequent shampooing of a donor’s hair slowly removes the ethyl glucuronide marker that has been deposited onto the hair. Bleaching the hair also leads to an increased concern for ‘wash-out’ effect. 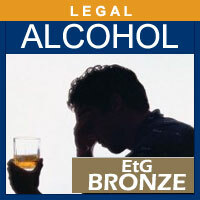 As a result, this EtG marker is sensitive to false-negative results, therefore testing in tandem with the FAEE delivers a more accurate report on alcohol abuse. AbuseCheck™ offers three distinct levels of its hair alcohol abuse tests for a broad range of users and applications, from legal cases to forensic investigations, from medical facilities to private homes. These tests are tamper proof, samples cannot be contaminated, and administration requires no expertise on the part of the person or facility. Simply collect hair samples at the required lengths and send them to our laboratory in the packaging we provide for analysis. Choose from AbuseCheck’s™ Bronze (EtG alone), Silver (FAEE alone), or Gold (FAEE and EtG combined) services; which provide results for different time periods (one months or six months). Each package tests a single participant and includes all collections materials, specimen collection, laboratory service, a comprehensive lab report, and shipping. This test measures levels of ethyl glucuronide (EtG) for evidence of excessive alcohol consumption with a detection window of three months. Hair samples are taken from the scalp, from as close to the root as possible to capture new growth which will be carrying the EtG markers. Although this test delivers excellent results, it is recommended that it be done in conjunction with the FAEE test to avoid the risk of false negatives due to “wash out” and the concomitant decline in EtG markers that can occur due to hair care. The Bronze level of testing is preferred when price is an issue and “wash out” is not a concern. This test measures levels of fatty acid ethyl esters (FAEE) with a detection window of up to six months back starting from two week after the time of collection. This highly accurate test is not subject to ‘wash-out’ effects from environmental conditions such as hair care or hair treatments, and hair samples may be taken from the scalp or elsewhere on the body if necessary. 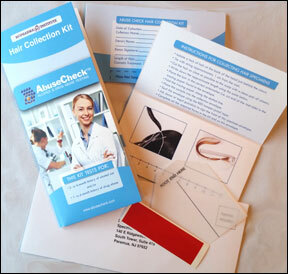 Longer hair samples are taken for this test. False negatives are eliminated thanks to the accuracy of the FAEE test. However, recent studies have shown elevated levels of FAEE in hair could be the result from hair treatment products containing alcohol (see: Forensic Science International, 2011). This is because the cells around the hair are capable of metabolizing alcohol and leading to an FAEE byproduct. As a result, this FAEE marker is sensitive to false-positive results, therefore testing in tandem with the EtG delivers a more accurate report on alcohol abuse. Taken together, these two Hair Alcohol Tests deliver the most value and superior results. With various hair lengths and testing for all relevant markers related to the breakdown of alcohol (from beer, wine, hard liquor, etc.) in the bloodstream, the Gold package shows irrefutable proof of alcohol abuse and/or dependency within a six-month detection window. It is the most trusted test among the legal profession for its accuracy and reliability against any external environmental influences. Order online, email, or call the BioPharma Institute today for more information or to order your Bronze, Silver, or Gold hair alcohol abuse testing package. You will have results within two weeks of our receiving your samples.